A salad that is full of colour and looks good enough to eat! Part of the fun is the assembling of the salad but you could change how I have it if you are feeling creative enough. This Cuban salad recipe is an easy salad to make and very refreshing. The dressing is fresh and tasty too. I had difficulty restraining myself from munching the whole plate in one sitting! 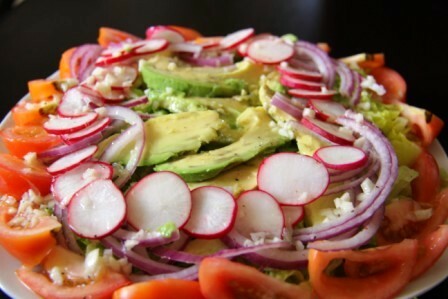 The salad is a melody of avocado, tomatoes, lettuce, onion and radishes. So simple and with a tasty dressing is very uplifting. It needs to be eaten pretty soon after making as the avocado may start to discolour.